AirAsia India made two firsts for itself in a span of two days. On 17th December, it started operating to Pune, connecting Pune to Jaipur. The airline operated its first non-immediate base return point to point route, with Bangalore-Pune-Jaipur-Pune-Bangalore. Although AirAsia India CEO Mittu told The Financial Express that “This is the first time we will be having a hopping flight“, the airline does not offer a Bangalore-Jaipur booking with Pune as a stop (hop). The flight number changes from 1424 to 3424 and 3425 to 1425. AirAsia today is the only airline to offer a direct flight between Pune and Jaipur. On 18th December, the airline started operating with its third aircraft : VT-RED, which is an A320-216SL with MSN 5824. The aircraft is a 1 year old airplane from AirAsia Berhad, which operated the aircraft as 9M-AQW. This is AirAsia India’s second used aircraft, and on account of its age, the oldest aircraft in the fleet. The average fleet age now stands at 10 months. 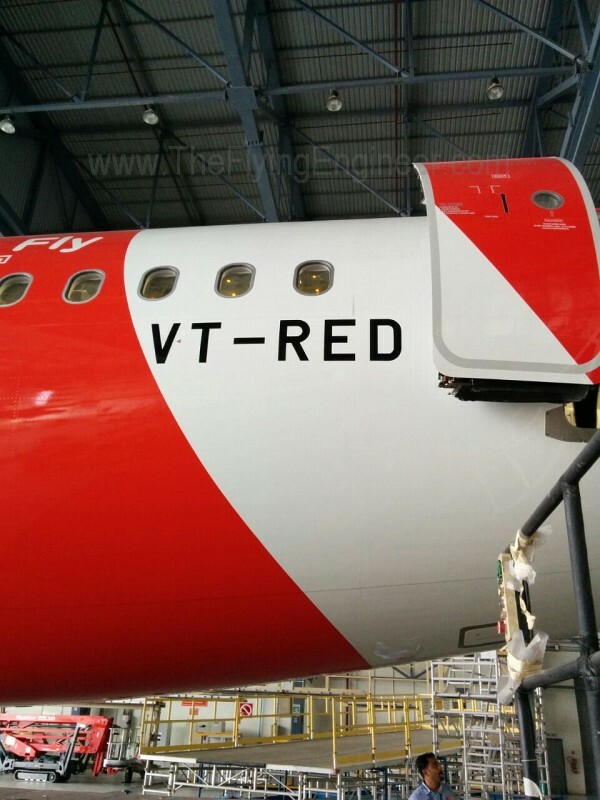 VT-RED flew in from Hyderabad at 00:40IST on 18th December. VT-RED breaks the VT-AT* series that the airline had hoped to continue. Reportedly, this is in line with AirAsia’s move across the group to focus on a ‘red’ theme. AirAsia Berhad changed its radio call sign from ‘Asian Express’ to ‘Red Cap’ on 16th November, 2014. It is believed that AirAsia India’s radio call sign ‘Ariya’, may be changed to something that includes ‘red’. On the same day – 18th November- the airline introduced its second direct Jaipur service from Bangalore. Jaipur’s timings now support the business traveller in offering a same day return. Presently, the airline intends to fly these three patterns, as shown below. However, with three pairs of simultaneous departures out of Bangalore, the airline may swap blocks of flights between the patterns. For example, the 13:15 Goa departure in Pattern 1 (cell in yellow) may be swapped with the 13:15 Pune departure in Pattern 3. Pune’s timings vary on Saturdays and Tuesdays. AirAsia India seems to have indefinitely dropped its Chennai early morning flight. The airline has been grappling with numerous delays in its operations, believed to have been caused by its shortage of senior cabin crew. The start of Pune operations on the 17th without the third aircraft proved to have heavily disrupted the airline’s schedule on the day, with delays as much as five hours. For the month of November, the airline had the second highest cancellation rate of 2.65%, which trailed SpiceJet – an airline that was riddled with numerous cancellations. Delays, which were very pronounced in November, and spills into December, resulted in 1,451 passengers being affected last month – the 4th highest in the industry. 225 passengers were affected by the airline’s cancellations. Considering the airline flew 61,000 passengers in November – a drop of 5,000 passengers from October – the percentage of affected passengers are significantly high. Load factors at AirAsia India rose by 3.6% compared to October, to 79.8% in November. While this may seem encouraging, it must also be borne in mind that the airline deployed a lower capacity in November, due to cancellations. In November, the airline flew 10,173 lesser seats, resulting in a seat capacity drop of 11.7% compared to October. Part of the high load factors may be explained through the servicing of affected passengers by re-booking them on another flight. Clubbing of flights, like at SpiceJet lead to misleadingly high load figures. Based on AirAsia India’s past behaviour, it seems unlikely that the airline will launch either a new route or induct a new aircraft by the end of calendar year 2014. The year may end with three airplanes and seven destinations. However, the airline has been the most unpredictable in the country’s history, with ”Anything can happen’ gaining prominence over ‘Now Everyone can Fly’.